Chef and food writer Robin Miller describes four skillet dinners that are delicious and easy to make. 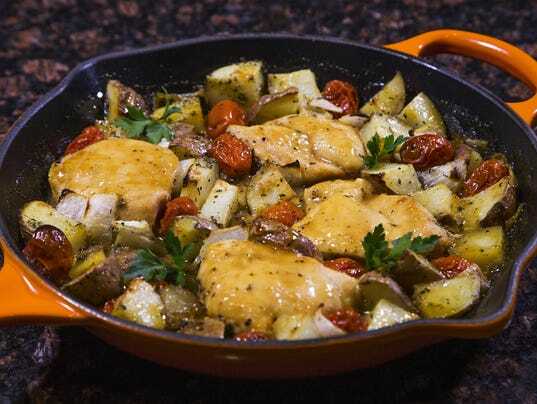 One-pan meals such as these skillet dinners allow you to spend less time in the kitchen and more time with your family. Check out four healthy recipes, including veggie pad Thai. It’s spring break, the kids are at home and hungry — day and night. What if I told you that planning — and executing — your next family meals could be joyful and carefree? The answer: Tasty meals cooked entirely in one skillet. Start to finish, everything is cooked in one pan, meaning you have one pan to clean. 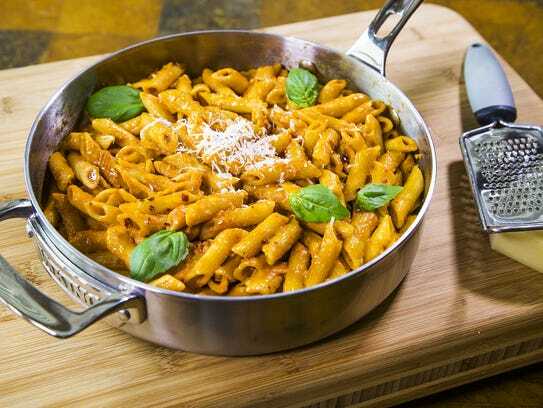 Penne ala vodka: Tender penne pasta, basking in a creamy tomato sauce that’s been kicked up with vodka and crushed red pepper flakes. The penne is cooked in the sauce, adding tons of flavor to your pasta. Nothing watered down here. And the benefit of the alcohol? Vodka acts as a solvent and brings out specific flavors in tomatoes that aren’t released in water or fat. A simple addition that brings the dish to an entirely new level. Chicken and potatoes: Herb-roasted potatoes and onions, honey mustard-glazed chicken and perfectly blistered grape tomatoes. Three different elements (as in, one main dish and two sides), cooked together as one happy skillet family. The oven does all the work, freeing you up to tend to other things. Like pouring a glass of wine? Salisbury steaks and gravy: Talk about a transformation. You won’t find onion soup mix anywhere near this recipe — and you’ll be thankful. 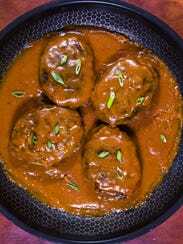 I mimicked the classic flavors of traditional Salisbury steak without using soup mix (which is basically dried onions, beef bouillon and copious amounts of salt). By dodging the mix, I had room for other flavorful ingredients, namely garlic and two forms of mustard (dried and Dijon). The mustard in the steaks perfectly complements the mustard in the gravy. Veggie pad Thai: Healthy vegetable pad Thai with all the flavors you’d find if you ordered this in a restaurant. The only thing missing is the monstrous amount of grease. The sauce is a sweet-and savory-combination of soy sauce, tamarind, rice vinegar and tomato paste, which adds sweetness without adding sugar. The rice noodles are cooked in the sauce, and adorned with garlic, ginger, bell peppers, onion, peanuts, cilantro and lime. Insanely good. Since March is National Nutrition Month, you can feel good about feeding your family healthy foods. Why it’s healthy: This creamy sauce seems decadent and rich, but it’s mostly tomato sauce with hints of sweet cream and salty cheese. The red pepper flakes add the perfect amount of heat, which is quickly mellowed on the palate by the creamy sauce. It’s an evolution of flavors, bite after bite. Heat the oil in a large skillet over medium. Add the garlic and cook for 30 seconds. Add the vodka and cook for 1 minute (this allows the alcohol to cook off; you won’t be able to taste it). Add the tomato sauce, red pepper flakes, oregano and onion powder and bring to a simmer. Add the water and pasta and bring to a low boil. Reduce heat to medium-low and simmer for 15 minutes, until the pasta is tender, stirring occasionally. Stir in the heavy cream and ¼ cup of Parmesan cheese and simmer for 1 minute to heat through. Serve with fresh basil leaves and extra grated cheese sprinkled over top. Note: If you don’t want to cook with alcohol, just leave it out and add more broth (½ cup, in this case). The dish will still be creamy, rich in tomato flavor and will deliver that delightful heat from the crushed red pepper. Why it’s healthy: This is one happy skillet. The potatoes and onions are tossed with herbs and roasted until golden brown. The chicken is glazed with a sweet and spicy honey-Dijon sauce. And the grape tomatoes lend their blistered sweetness, balancing all the flavors on every level. Combine the potatoes, onion, olive oil, basil, thyme, garlic powder, salt and pepper in a large, ovenproof skillet and toss to combine. Bake for 15 minutes. Push the potatoes aside to make room for the chicken and tomatoes. Add the chicken to the skillet and season the chicken with salt and pepper. Arrange the tomatoes all around the chicken and potatoes. In a small bowl, whisk together the honey, Dijon mustard and paprika. Spoon the mixture all over the chicken. Return the skillet to the oven and bake for 20 more minutes, until the chicken is cooked through and the potatoes are golden brown and tender. Top with parsley leaves before serving. Why it’s healthy: A robust and more satisfying version of the timeless classic, made with lean ground beef. Perfectly seasoned steaks, seared and then simmered in a scrumptious, finger-licking gravy. In a large bowl, combine the beef, breadcrumbs, egg, 1 teaspoon of the onion powder, garlic powder, mustard powder, salt and pepper. Mix well and shape the mixture into 4 oval patties, each about 1-inch thick. In a medium bowl, whisk together the broth, ketchup, Worcestershire sauce, flour, remaining teaspoon of onion powder and Dijon mustard. Add the broth mixture to the pan (over medium heat) and bring to a simmer. Return the steaks to the pan, reduce the heat to medium-low and simmer for 10 minutes, until the sauce thickens and the steaks are cooked through.Top with green onions before serving. Why it’s healthy: This is one of my favorite vegetarian dishes on earth — sweet, tart, salty, chewy, crunchy and saucy, and low-fat. If you want added protein, add grilled tofu, diced cooked chicken or steamed shrimp. In a medium bowl, whisk together the broth, water, soy sauce, tamarind paste, rice vinegar, tomato paste and paprika. Set aside until ready to use. Heat the peanut and sesame oils together in a large skillet over medium. Add onion, bell peppers, garlic and ginger and saute for 3 minutes, until soft. Add the broth mixture and noodles and bring to a simmer. Reduce the heat to medium-low and simmer for 5 minutes, until the noodles are tender, stirring occasionally. Push the noodles and vegetables to one side of the pan to make room for the eggs. Add the eggs to the skillet and cook for 1 to 2 minutes, until the eggs are cooked through but still moist. Fold the eggs into the noodles. Top the noodle mixture with the peanuts and cilantro and serve with lime wedges on the side.